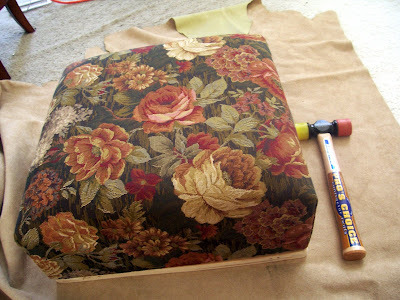 This is my latest reconstruction project. 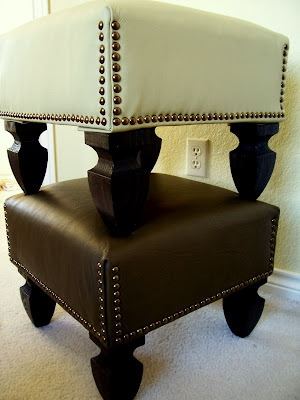 From ottoman to coffee table. After seeing the yard totems https://www.craftster.org/forum/index.php?topic=120848.0 here on craftster, I wanted to make something similar. I bought lots of crystal plates and vases from the thrift shop and made candle holders. My mom bought this complete piece of crap for 15 bucks from some lady. We had to drag it out of the lady's basement and drag it home, it's large and bulky, and heavy. It's made from very cheap materials, and is pretty much good for nothing. A million times my mom regreted lugging this thing to our already cluttered house. I wanted to do something to help this buffet, and at the same time I needed to get more practice with different or new materials. For a long time I went back and forth on what to do with this monster, and finaly, after months of staring at it's uglyness I was inspired by an ad in Architectural Digest (I'll post it up if I ever find it). The work on this thing took a long time, it was of course interupted by life, but slowly, little by little (with lots of help from my dad) I finished. Basically it's all just paint, and then I added the legs, which were in a previous life table legs, which we chopped and attached. I found this side table near a dumpster and took it home. It was a bit broken and had many water rings on the surface. I sanded it down and pondered what to do with it. If the wood is good, I don't usually prefer to paint over it, and the wood was good, but it just didn't call out to be stained. Painting it white was the only thing that felt right. 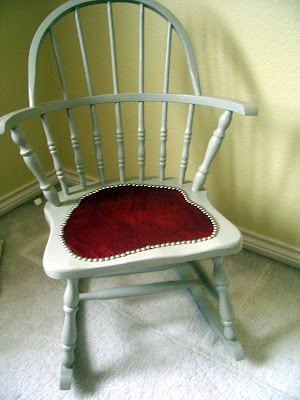 So I painted, and painted, and varnished, and then glued the little buttons to the rim, then painted some more. 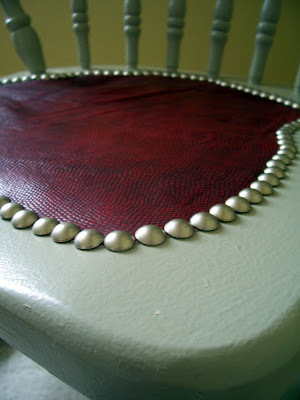 After all that I bought car mirrors, and glued them to the table, I needed some texture. But I'm still not sure I like it. I bought this little nightstand at a thrift shop for 5 bucks. The paint job was crappy and peeling off, but I liked the square shape. 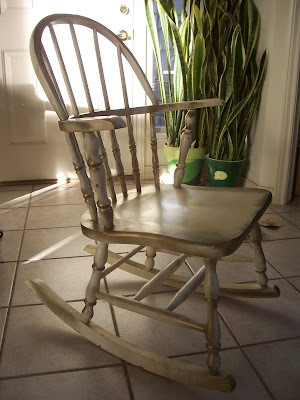 I stripped all the old paint off, then sanded the remains. Spray painted the entire thing a clean white and then varnished. Bought some moulding from my favorite store, cut it, spray painted it with a pretty hammered black and then glued it all on. That's about it, hope you like! Don't ask about the title of this post. These things just reminded me of beans, and I guess they're bowls, and I painted them, so that's that. I just sanded them and painted and varnished. I don't know, they aren't anything miraculous, but I kinda liked the shape and wanted to make something out of nothing. My mother has always been a fan of storage and organization, in her mind. In reality, our house never had anything to put other things into. I badly wanted a large armoire, but they were too expensive, and never my style. My parents dug these four bentwood chairs out of some rotting warehouse. They were in terrible shape, most were about to fall apart. My dad fixed the structure and I did the decorating. 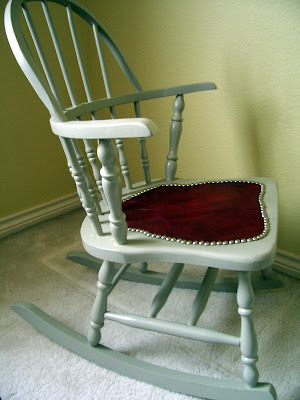 The process was exceptionally long for something so simple, but before I could start doing anything to them, I had to strip the old paint off. Chemical stripper is not a pleasant experience, especially on such thin and curved surfaces. Each chair took more than 2 hours to strip, not to mention the fumes and burning fingers. After the paint came off, I realized that they were beyond any hope of re-staining, I had to resort to painting them. The red took 5 coats, the rest 2. Then a coat of oil based varnish, and all new seats and seat covers. I'm so freaking glad it's done, I don't want to think about these chairs ever again, whew. They were much worse then this picture can capture. 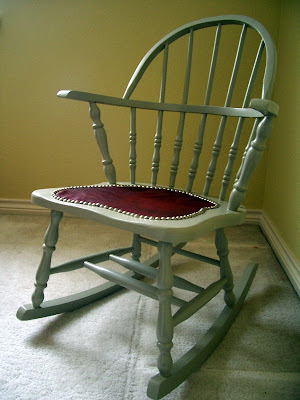 My mom bought this rocking chair at a thrift store. 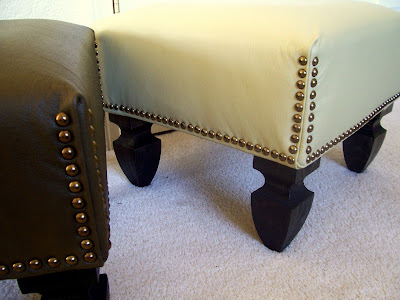 I'm personally not a fan of rockers, but wanted to modernize this one. Hopefully I completed my task. (The red seat is leather) Thanks for looking! 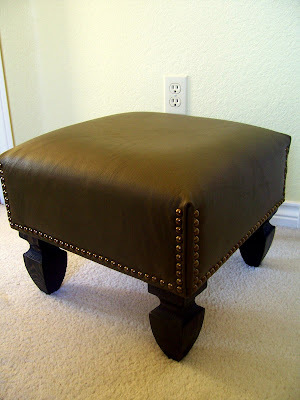 My mom picked up two of these little ottomans/footstools from some thrift shop somewhere, who in turn received them from ROSS. The only thing missing from the BEFORE pic are the little ugly plastic feet they came with. 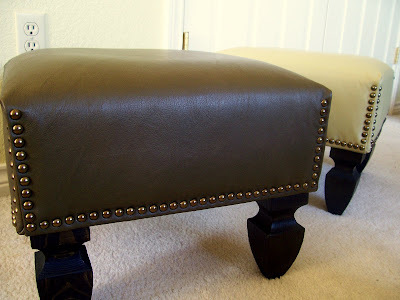 My father ripped the feet off, nailed on a thick piece of plywood, and I reupholsted them in some leather I bought on ebay. The new feet are technically some sort of fence post finials from Home Depot, but I liked them as feet. 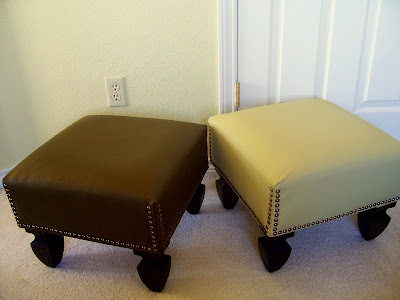 I sanded, stained, and varnished them, then screwed them into the base of the footstools. They are of course flawed, but it's the best I could do with the materials I had. Thanks for looking, hope you like.